Climb aboard the sweet tooth train with your army of Gummy bears who are just waiting to give you bonus games to play. 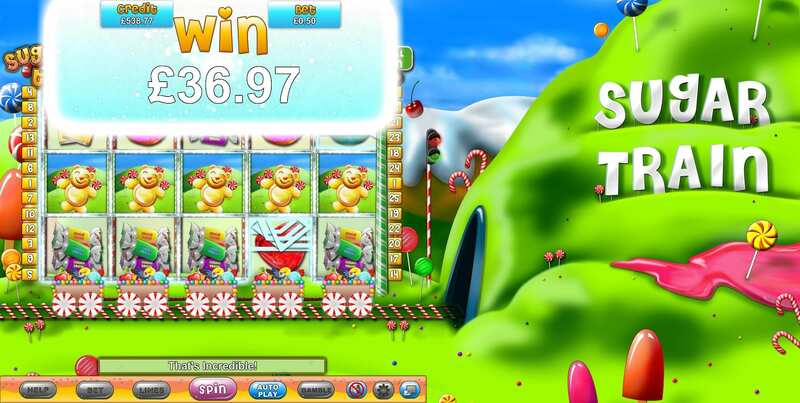 The Sugar Train Slots game does not require a ticket to board, but can certainly be your ticket to big riches. This Slot is relatively easy to master so acts as a perfect entry point for new gamers to play the latest 3D slots online. 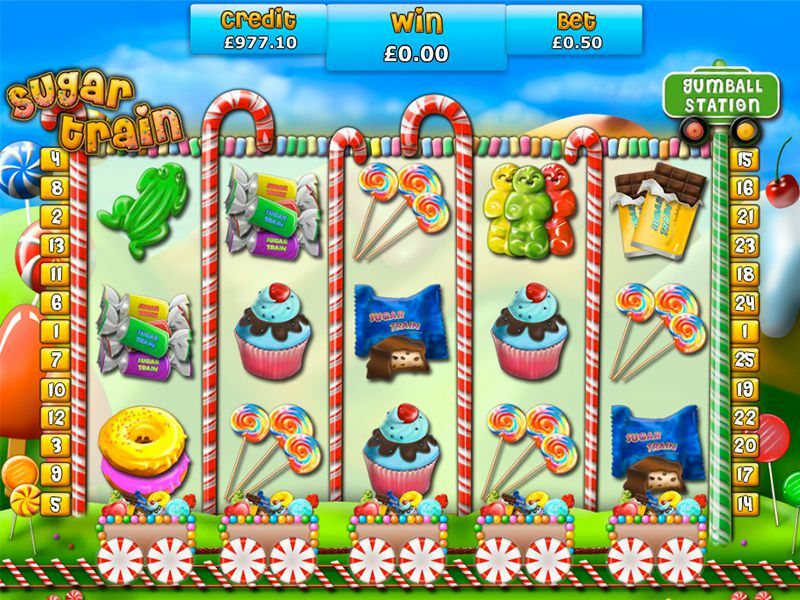 Sugar Train slots is a game that your dentist definitely won’t want you playing! This is one of the tastiest slot online games we have seen and it’s one which leaves us licking our lips in anticipation. This is a slot festooned with sweet treats and snacks and candies of every description, so if you have a sweet-tooth then have we found the one for you! So why not try this game? If not, you can always find new slot games here at Wizard Slots. Eyecon has hit yet another home run with Sugar Train slots game! With such an illustrious selection of the best slots behind them, including the likes of Fluffy Favourites and Shaman’s Dream, then you are assured of a great quality game with a superb interface. Eyecon has done a tremendous job with the graphics and topped that sweet treat off with a superb bonus round that makes this game another stand out product from that developer. This really is the sweetest of games, a sugar-laden fantasy of epic proportions based on 5 reels and 25 sweet-treat covered pay lines. You won’t hurt your teeth or your waistline in this game though, and the only things that should be getting heaver are your pockets full of sugar-free payouts. As usual with Eyecon the minimum bet is 1 penny –with a maximum of £50 per spin giving players of all budgets the option to maximise their enjoyment. What more can you ask from top-rated slots such as this? Bonuses feature heavily though, so don’t assume it’s all sugar-laden goodness, there are some nice prize goodies lurking in here. Everyone’s favourite Gummy Bear is the symbol for substitutions, and as you’d imagine he has the ability to switch places with other symbols in the game, with the only exception to this being the scattered rainbow. Our friend Gummy Bear is also able to appear scattered and if you get 3 or more on the reels you will score for some free games. You will get 15 free games for the first 3, but land 4 or 5 and you’ll receive an even bigger bonus free spin offer. We mentioned earlier that the Gummy Bear can’t substitute for the scattered rainbow – so what does that do? Well, the Rainbow scatter unlocks the rainbow pick feature, and the more scatters you can get the more picks you will create, with each pick uncovering a prize. Once you reach the end of the feature all the rewards will be totalled to make up the final prize. Be sure to keep a beady eye on the gumball meter which is at the side of the reels, as when that’s full up then the gumball bonus will begin, and with every gumball having the potential to award you up to X100 your total wager, you don’t want to miss them. When it comes to games, they really don’t get any sweeter than this one. However, the design is only the beginning. It is packed with bonus features that make it as lucrative as it is mouth-watering. The bonuses are quirky, especially the inclusion of the gumball feature. This one provides a bit of difference from generic, tired games.